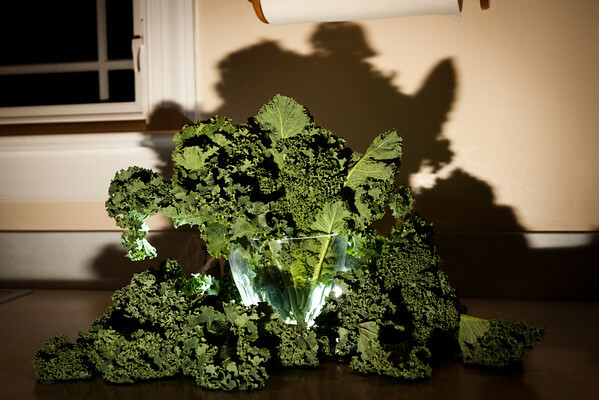 January 4, 2012 - Killer Kale. Canon 5dII, EF 24-70 f2.8 USM zoom @50mm. 1/60th @ f/5.6, iso 200. Lit with overhead incandescent floods, plus a Canon 550ex speedlite gelled 1/4 CTO held below the camera pointed up at the kale, and a 430ex speedlite set to 1/16th power, buried in the greenery and aimed straight at the vase. Used an ST-E2 to trigger them strobes. Retouched in Lightroom to adjust the white balance, contrast, crop and then added some post crop vignetting. We get a "green grocer" box now and then - today they screwed up and we got part of ours and part of one that probably should have gone elsewhere. There were 3 bunches of kale included. Not really sure what to do with it, other than use it as a photo subject. Anyone want some kale? Speak up! Improvements - probably could use a bit more context to say "kitchen" in the background. I actually cleared the decks a bit, moving appliances and trying to angle myself to cut the paper towel holder and the sink out. I do like the hard shadow, ala Ed Wood, in the back ground. If I had another light, I could have given it some contrasting color. Sad note today - Penn Camera is filing for Bankruptcy.